I can't remember when it was I discovered The Pogues. I had never heard of them, but their name and the record covers got me interested and I started buying their albums. I must have been fifteen or so.There was something very literary about their songs and it was easy for me, as a teenage miserabilist, to relate to the whole vibe of the band. For years, their songs decorated my room with a strange nostalgia for a life I had never lived. For years, I never found anybody else who liked them as well, so I felt completely alone in my fascination with them. 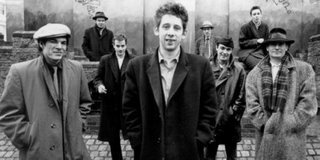 This was the pre-Internet era, of course, so I had no idea what the Pogues actually meant for pop culture. Shane MacGowan, along Black Francis-Frank Black, Tom Waits and Nick Cave and others, leaded my own private pop pantheon. It hasn't stopped raining, and the city gets that strange glare; the light struggles with the sound of cars passing on wet roads. Pour yourself a glass of whiskey and show some respect. Cheers. Yo no habría encontrado calma después de aquella ruptura amorosa de no ser por ese momento mágico en que tu hermano, tú y yo hicimos una pausa para escuchar "Tuesday Morning". Estos también te los debo a tí.